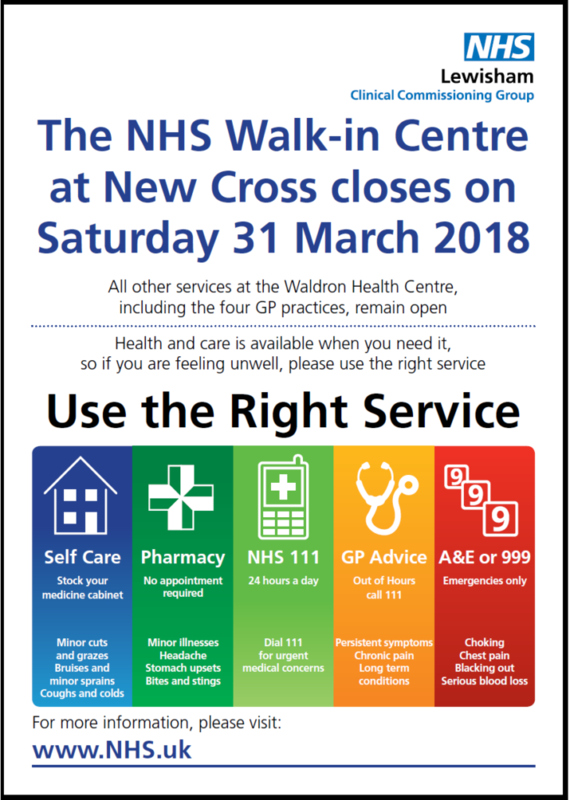 Following the formal consultation on the future of the NHS Walk-in Centre, New Cross and improving access and provision to primary care, NHS Lewisham Clinical Commissioning Group (CCG) has decided to close the NHS New Cross Walk-in Centre on Saturday 31st March 2018. All other services at the Waldron Health Centre are unaffected. During this transition period the CCG will support patients to use the right service, this will include providing a Patient Advice Liaison Support (PALS) service located at the Waldron Health Centre. The service will support people who are not registered with a GP to do so quickly, to ensure they can be seen by a GP if appropriate and provide signposting to other services. The CCG will embark on a communication campaign to help local people understand how they can access GP appointments and health care services starting at the beginning of March and more information will be made available online. Dr Marc Rowland, GP and Chair of NHS Lewisham CCG said: “We are always looking at ways we can improve access to primary care. There is a range of health services across the borough that we believe will provide the best health outcomes for Lewisham residents. We are confident that the alternative services we have commissioned are able to better meet the on-going needs of all of our population”. The GP Extended Access (GPEA) service provides additional appointments with local GPs 7 days a week, 8am to 8pm for patients who cannot get an appointment that is convenient for them. All appointments must be booked in advance at your practice and are available to anyone who is registered with a Lewisham GP. Located within a purpose built suite at University Hospital Lewisham, these appointments are exactly like an appointment at your own GP practice, and the service can see babies and children and has nurse appointments for treatments such as wound care and ear irrigation. Pharmacists are medically trained and can give you expert advice on medicines and how they work as well as help you decide whether you need to see a doctor. You don’t need an appointment or even make a purchase and you can talk to them in a private consultation area and in confidence. For minor illnesses, headache, stomach upsets, bites and stings, you should visit your local pharmacy. NHS 111 is much more than a helpline, it is there to help anyone worried about an urgent medical concern get the right attention fast. When it’s not an emergency, patients should call the free NHS 111 service to receive medical attention urgently when you need it. For minor cuts and grazes, bruises, minor sprains, coughs and colds you can self-care. With self-care you can take control and start to feel better quicker. Try to ensure your medicine cabinet has all the basics such as plasters, bandages and pain killers, you can download a list here. If medicines are past their use-by date, do not use them. Always keep medicines out of the reach and sight of children. For life threatening emergencies please go to A&E or call 999.